Funeral services for John J. Conard Sr., 86, Lawrence, will be at 11 a.m. Monday at Plymouth Congregational Church. Graveside services with military honors will be at 10:30 a.m. Tuesday in Fairview Cemetery in Greensburg. Mr. Conard died Friday, Oct. 12, 2007, at his home.He was born June 30, 1921, in Coolidge, the son of Joseph Harvey and Jessie Shanstrom Conard. He attended Kansas University as a Summerfield Scholar and received a Bachelor of Arts degree in journalism in 1943. He was a member of Phi Beta Kappa, Sigma Delta Chi, Pi Sigma Alpha honoraries and Tau Kappa Epsilon social fraternity.Mr. Conard returned to KU after he served in the military and received a Master of Arts degree in political science. He received a Rotary Foundation fellowship for doctoral studies in international law at the University of Paris.He and his wife, Virginia, moved from Lawrence to Paris in August 1949. He completed his doctorate in 1951 and graduated with highest honors. He wrote his doctoral thesis on the initiatives of France toward the unification of Europe.Mr. Conard served in the U.S. Navy, where he learned to fly dive bombers and served as a flight instructor at the end of World War II.He was an instructor of political science at KU while completing his Master of Arts degree requirements. He was appointed to the U.S. Foreign Service and lived in Paris until 1954. He transferred to Washington, D.C., where he worked one year for the government.Mr. 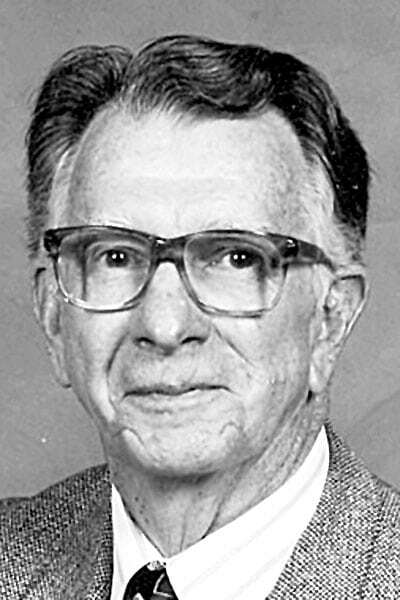 Conard accepted a position as editor of the Syracuse Journal, a weekly newspaper, before he and his wife in 1956 purchased two weekly newspapers, The Kiowa County Signal in Greensburg and The Haviland Journal in Haviland. They later purchased The Mullinville News. They sold the newspapers in 1970. He served as an elected state representative in Greensburg and was speaker of the Kansas House during his final term from 1967 to 1968. He was the Republican nominee for lieutenant governor in 1968 and served as chief of staff to James B. Pearson, U.S. senator, in Washington in 1962.Mr. Conard became KU director of university relations in 1970 and then assistant to three KU chancellors, Chalmers, Nichols and Dykes. He returned to state government as chief of staff and executive assistant to Gov. Robert Bennett in 1975 and was selected by the Board of Regents to become executive director for the board from 1976 until he retired in 1982. He served as vice president of the Higher Education Assistance Foundation, president of the Higher Education Loan Program of Kansas and senate liaison for Gov. Mike Hayden. He served on the William Allen White Board of Trustees since 1959.He was a member of Veterans of Foreign Wars and American Legion. He was a member of Big Springs United Methodist Church and a longtime member of Plymouth Congregational Church and Lawrence Rotary Club, where he was a Paul Harris Fellow. He was a member of First Christian Church in Greensburg, where he served as an elder. He personally planted and cared for between 2,000 and 3,000 trees in Greensburg, many of which were destroyed in the May 2007 tornado there.He married Virginia Powell on Sept. 13, 1947, in Olathe. She survives, of the home. Other survivors include three sons; James P., Olathe, Spencer D., Charlotte, N.C., and John J. Jr., Lawrence; a sister, Violet Conard, Skagway, Alaska; and eight grandchildren.The family will receive friends from 6 p.m. to 8 p.m. Monday at Warren-McElwain Mortuary in Lawrence.The family suggests memorials to Big Springs United Methodist Church, Trees for Greensburg Fund or the Building Fund at Plymouth Congregational Church, sent in care of the mortuary.Online condolences may be sent at www.warrenmcelwain.com, subject: Conard.